Don't let the cute polka dot exterior of the ladybug fool you. Their outershell masks a hidden complexity that has long been a mystery to scientists. 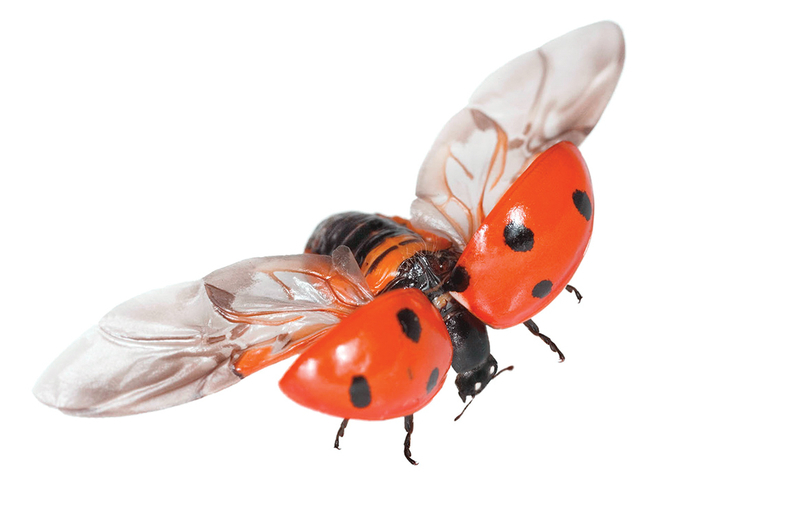 Almost like an organic origami creation, ladybug wings emerge from underneath a shell to propel the bug into flight and potentially into applications all over science. Japanese scientists were curious how ladybugs folded their wings underneath their shells, so they surgically removed several outer shells and replaced them with glued-on artificial clear silicone shells to better examine the underlying folding mechanism. Using high-speed slow-motion cameras they captured a detailed look at the bugs folding and unfolding their wings. They found that the edges of the outer shell, as well as the veins, play a critical role, and that the springlike static frame is key to their transformation. Observing how the bug is able to fold and carefully tuck away such a vital structure has led to some interesting insight into a range of foldable deployable structures such as satellite antennas, fans and medical instruments. "The ladybugs' technique for achieving complex folding is quite fascinating and novel, particularly for researchers in the fields of robotics, mechanics, aerospace and mechanical engineering," said lead researcher Kazuya Saito of the University of Tokyo's Institute of Industrial Science. It could even solve a more mundane problem. "I believe that beetle wing folding has the potential to change the umbrella design that has been basically unchanged for more than 1,000 years," Saito told the Telegraph newspaper.